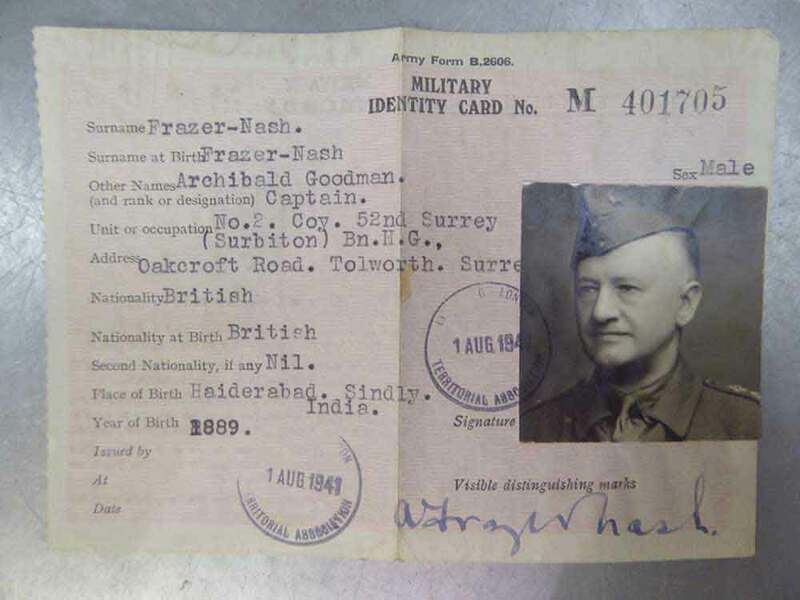 Archibald Goodman Frazer-Nash, M.I.Mech.E. – engineer, inventor, designer, racing star and aeroplane pilot. Throughout his life he had a larger-than-life, ebullient personality, almost certainly due to his mother, who had qualified as a medical doctor and surgeon at a time when women were rare in either profession. Archie’s interest at school for engineering led him to take a City and Guilds Institute course, after having served for a year on merchant ships. He undertook an apprenticeship at Willans & Robinson with his college friend, Ron Godfrey, and their combined enthusiasm for motoring brought about their first joint creation, the GN in 1910. During the First World War, work at GN Ltd concentrated on munitions, with Archie working for the Air Armament Design Section on the synchronisation of machine gun fire through a plane’s propeller arc. This not only gave him experience of flying, but also an understanding of aircraft design, and a commission as a Captain in the newly formed Royal Air Force. In 1923 the end of GN Ltd. marked for Archie the start of production of cars bearing his name in the newly formed Frazer Nash Cars Ltd. These were cars with GN-based chassis and multi chain transmission, but with four-cylinder engines. Like their creator, these cars had so much of Archie’s personality in them that they attracted a particular type of owner. By 1929, Archie’s health was deteriorating to the extent that he sold the company to his Sales Director, H.J. Aldington, and for a short while managed and drove in a team racing Austin Sevens for Herbert Austin. What is extraordinary, considering Archie’s state of health at the end of the 1920s, is the prodigious amount of work and time that he then devotes to the invention, design and patenting of a vast number of engineering projects over the next thirty years, commencing with the Frazer-Nash crane load indicator. This is a device for alerting crane drivers when approaching a safety critical point of imminent imbalance. With the threat of war looming yet again, Archie began to work on the Frazer-Nash gun turret, capitalising on his First World War experience of hydraulics and solving problems with gun mounting movement. Through his companies Nash & Thompson and Parnall Aircraft, he and his team of engineers continually refined the various types of gun turret which were deployed in bomber aircraft and on tanks throughout most of the war. Thereafter, and up until his death in 1963, Archie was involved in a succession of projects that took him into the atomic industry and on the ill-fated TSR2 Bomber project. Wherever there was an engineering problem to be solved, Archie would relish the challenge. 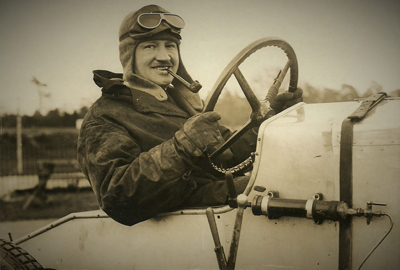 Archie Frazer-Nash as an engineering entrepreneur lives on in the name of his cars and an engineering consultancy business which to this day, is still involved in solving complex engineering challenges across a range of sectors including defence, aerospace, power, industry and transport. 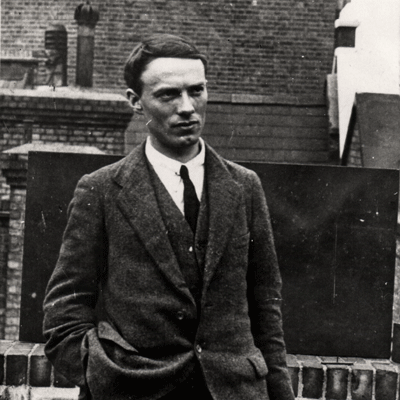 Ron Godfrey standing on the roof of the Works circa 1918. Henry Ronald Godfrey. In 1901 Ron was given a 1.33hp Clement engine which he fitted into his pushbike. His working life started as an office boy at Werner motor cycles but he left in 1904 and signed on at Finsbury Technical School. Here he met Archie (Frazer) Nash. They were apprenticed together at Willans & Robinson. In 1908 he helped Nash in making his first creep-about and the two then formed a partnership, GN Ltd. Ron Godfrey designed the 90-degree v-twin GN engine. His main role was to manage the production lines and general engineering development at GN Ltd. He competed at Brooklands, but not to the same extent as Archie. Ron Godfrey (and AF-N) disagreed with later partners at GN Ltd and in 1923, during the worsening slump, left to set up his own business, initially servicing GN cars. In the mid-1930s he formed a new company with E.A. Halford and G.H. Robins to build the HRG car, on similar lines to the Frazer Nash but without the unique chain drive. Retired in 1958. Officiated as an RAC scrutineer and observer. H.J. Aldington, 1902 – 1976. In contrast to Archie Frazer-Nash who was a skilled engineer, H.J. Aldington excelled as a salesman. Harold John Aldington, known since a boy as ‘Aldy’, started an apprenticeship in 1920 at GN Ltd in Wandsworth, in the greasing shop. In his spare time he began to buy and sell used motorbikes. When his apprenticeship finished he moved to Black & Finch Ltd (ex GN Motors men) in Great Portland Street, as a salesman of motorcycles and cars. B&F became agents for the developed GN of Archie Frazer-Nash and very early Frazer Nash cars. In 1925 Aldy moved to Frazer Nash Ltd. as salesman. He mixed with the sporting fraternity at Brooklands, selling cars by driving to prospective customers in a Frazer Nash. He then left to set up his own concern, later joined by younger brother Don to eventually form Aldington Motors in Kew where they became Frazer Nash agents. However, in December 1928 Aldy (and brother Don) became a director and then Managing Director of AFN Ltd, a position he held until 1965. In addition to his business acumen, Aldy was also an exceedingly competent driver and competitor, especially at Brooklands and on trials, renowned especially on the ‘Mountain Circuit’ at Brooklands. He was incredibly successful in the Alpine Trials where, for three years running over 1932-34 he won a coveted Coupe des Glaciers. 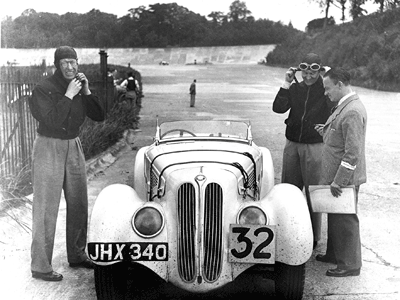 At the end of 1934, having seen the great success of BMW on the Alpine Trial of that year, Aldy signed an agreement for AFN Ltd (formerly Frazer Nash Cars Ltd) to become the exclusive British agent for some of the BMW models, a name almost unknown in Britain at the time. The imported cars were fitted with ‘Frazer Nash-BMW’ radiator badges to brand them with a familiar name. Customers began to transfer to these new cars and the company prospered until the outbreak of war in 1939. After the war BMW were not allowed to manufacture cars and so Aldy persuaded Fritz Friedler of BMW to come over to England to work on the development of a car based on the BMW engine and chassis. It was in one of the early examples that Aldy drove in the 1949 Le Mans 24 Hours race, with Norman Culpan, which was to be his last competitive event at the age of 47. Aldy arranged for AFN Ltd to become the exclusive agents for Porsche cars from 1954 onwards. His son, John, later took on the running of the company in 1965 and Aldy died eleven years later in 1976. Son of H.J. “Aldy” Aldington. With a father and two uncles involved with Frazer Nash Cars Ltd and then AFN, it was no surprise that John should follow in their footsteps at AFN. Following a brief spell in the Royal Navy which wasn’t to his liking, he attended engineering college where it was the business and time-and-motion aspects that interested him most. At the end of the 1950s John began to learn the ropes at AFN and introduced more modern methods of business management. He was appointed a director in April 1965. 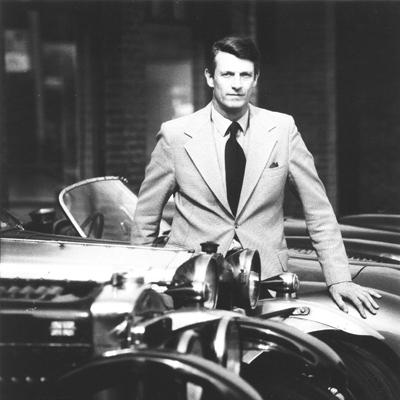 As his father’s health declined, John took on more and more of the responsibility in running the business, overseeing AFN’s expansion as a Porsche agent, and involved in the formation of Porsche Cars Great Britain Ltd. Eventually, John Aldington became Managing Director of that company. A qualified engineer, he joined the BMW firm in 1932 as chief designer, after working for Horch, designing 8-cylinder and V12 cylinder cars. Fielder and Rudolf Schleicher, with whom Fritz had worked at Horch, were responsible at BMW for the new series of 6-cylinder cars that were to set the car division of BMW on the road to success. Fiedler was based at Eisenach in overall command of the car side of BMW, specialising in chassis, suspension and aerodynamic design and development. During the war he was occupied with military vehicle design and development and finished up at Munich, fortunately, so that he was in the American zone at the end of the war. In 1947, at the persuasion of H.J. Aldington, he joined AFN Ltd., and although he was loaned to Bristol as a consultant on their Type 400 project, he did most of his work in England at Isleworth, where he was always known as Dr. Fiedler, although he did not have that title in Germany. He was very popular with the workforce at AFN, and everyone admired his engineering qualities. He took charge of the development of the post-war Frazer Nash, dealing with chassis, suspension, body design and construction and development of the FNS Bristol engine. On the Isleworth dynamometer he got over 100 bhp from the Bristol engine before the Bristol engine men did. He spent three years with AFN, returning to BMW in Germany where he was responsible for the new V8 engine and the 500 series of cars. During the war he had been a director of BMW, and became Chairman of BMW-AG from 1955-56, retiring in 1966.